The Breckland Society was set up in 2003 to encourage interest and research into the natural, built and social heritage of the East Anglian Brecks. We are a membership organisation working to help protect the area and offering a range of activities to those who wish to see its special qualities preserved and enhanced. The Brecks cover over 370 square miles of inland Norfolk and Suffolk. Click here to see a map of the area. This is a unique part of Britain, traditionally characterised by huge tracts of open heathland. The word ‘breck’ was used to describe temporary fields, which were ‘broken’ from the heath and allowed to revert once the soil was exhausted. 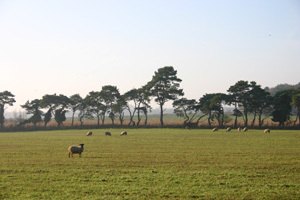 Historically this was an open, steppe-like landscape populated by sheep and rabbits, but in more recent times large scale forestry and intensive agriculture have changed the face of Breckland. Many of the traditional human occupations, such as flint-knapping and warrening, have all but disappeared and the area’s very particular atmosphere risks being changed forever in the face of increasing developmental pressures. We are delighted to have received a grant of almost £10,000 from the National Lottery Heritage Fund for a project, that will run through the rest of 2019, to look at the impact of the Cold War on our area of Norfolk and Suffolk. It will include visits to Cold War sites, original research, interviews with those who were involved and/or affected, and educational events for those who never lived through the era. For more details, including the press release, and further events as they are scheduled, click here.